UK powered access platform rental company, Star Platforms, has worked with Wood Street Walls CIC to provide a Skyjack 6832 Rough Terrain (RT) scissor lift for their recent project; Madge Gill mural. 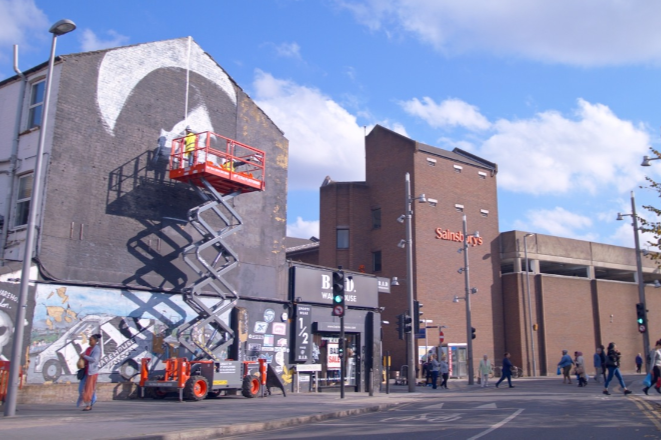 Wood Street Walls brings public art to East London for residents and visitors to enjoy and called upon Star Platforms once again to help provide powered access equipment for their latest project. The Madge Gill mural project is part of the LDN WMN project, a collaboration between City Hall and Tate Collective. The project is part of Mayor Sadiq Khan’s #BehindEveryGreatCity campaign, which marks 100 years since the first women won the right to vote in the UK. In collaboration with local project “Works by Madge Gill”, the community were invited to vote on the background pattern of the proposed portrait of the artist via Wood Street Walls annual “Pick Your Pattern” initiative. as the equipment required to complete the task at hand.